Writer Sergio Blanco and translater/adaptor Daniel Goldman layer reality and fiction in a thematically rich, intelligent play. Thoroughly embedded references to the Oedipus myth, early Christianity and the use of metatheatre endow the story with a timelessness even though it is very much set in the present. These themes also pointedly differentiate the characters’ education and social class – the crux of so many of the UK’s ills, now and historically. Blanco and Goodman’s script deconstructs theatrical conventions and storytelling to draw more attention onto the British legal system and its procedures, which further aids the gaping inequality between the characters. This acknowledgement of and playful toying with theatrical convention is delightfully unexpected. The writers also use a basketball game to inspire the play’s structure, but this is a story that could easily be told in a concise 90 minutes without an interval. The two performances are excellent. Trevor White is the easily erudite, articulate writer whose subtle emotional journey is almost imperceptible. Condescension eventually gives way to genuine care and compassion for Martin, played by Alex Austin. Austin is a terrifying Martin, a too-tight coil of razor wire that could lash out at any moment. Austin also takes on the sweetly keen Freddie, an actor working with White’s writer. They have fabulous chemistry; their contrasting characters clash, spark and breathe together in all the right ways. The only downfall is that both actors are white. The three men we see are almost as contrasting as they can be, yet each one personifies a different masculinity with corresponding insecurities, prejudices and world views. 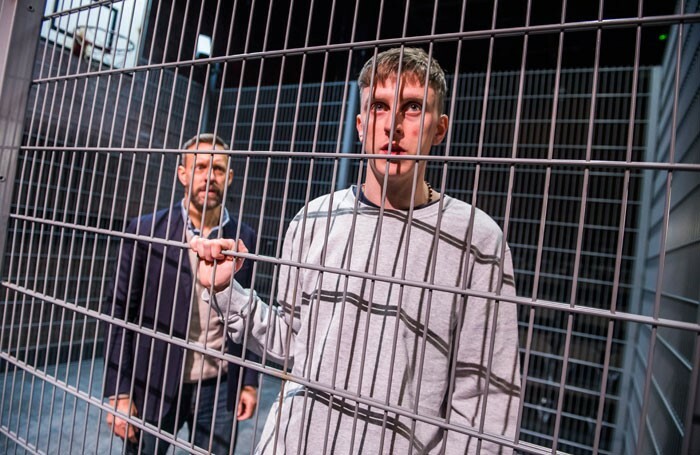 With cleverly utilised dramaturgical devices and a compelling story, Thebes Land is a smart, culturally literate play with biting social commentary and a rich theatrical background. Thebes Land runs through 7 October.